The Godin Multiac Grand Concert Duet Ambiance combines elements from solid bodied instruments with classical guitar concepts to create a wonderfuly versatile instrument that sounds as good as it looks. The unique design by Godin means that this guitar is virtually free of feedback, this makes it ideal for use in a band that has tendencies to get loud, or even as a stand alone guitar. The body of the Godin Multiac Duet Ambiance is made from high quality Mahogany with a gorgeous, Solid Cedar top. 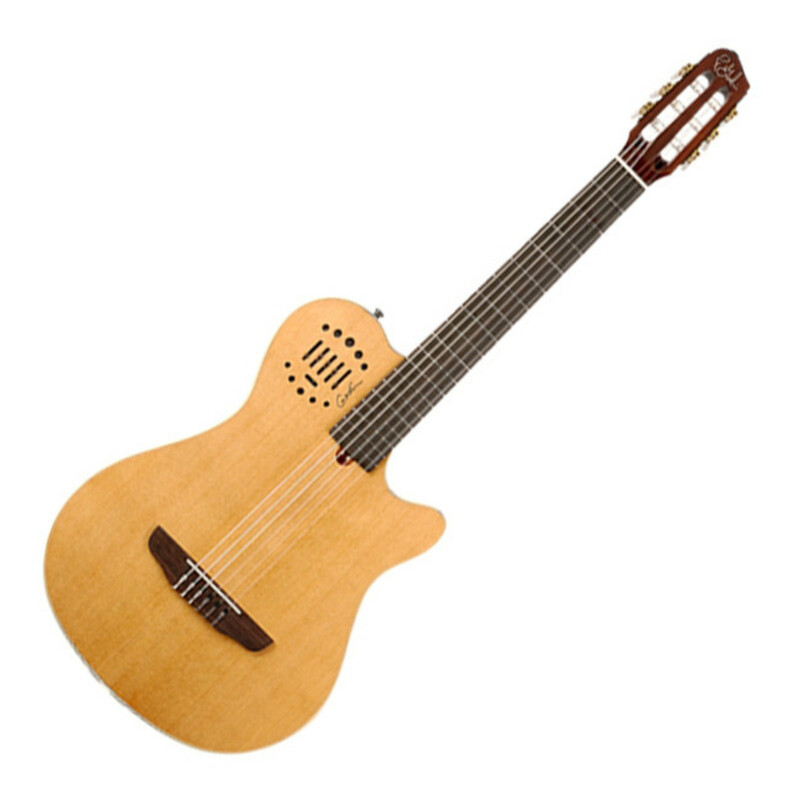 The body itself is chambered however the response from the top is more typical of a solid body design than that of a traditional acoustic guitar. The neck, which joins the body at the 12th fret, is made from Mahogany and provides a fast and comfortable playing experience. The Multiac Duet Ambiance is equipped with custom electronics by Fishman. This system allows you to select between 4 individual mic settings via the 4 way selector switch.Ideal guitar for players looking for a an incredible, amplified nylon string sound and feel in a live and loud band setting with virtually no feedback.